1899 was the Blues first season in the FA Cup (it was their first season full stop) and that meant playing in the qualifying stages. The draw threw up visitors from overseas but the caulkheads proved to be no match for the newly formed Pompey who reached double figures with no reply. Clearly a replay was never on the cards, which was fortunate, as the hovercraft wasn’t to be invented for another 50 years. Pompey were chasing promotion to the top tier and a good win was needed not only to settle the nerves but also to boost goal average. A good win is certainly what the rain-soaked crowd of 15,768 got that day with hat-trick hero Willie ‘Farmers Boy’ Haines leading the Blues on to a hefty league win that still stands as a record to this day. The 1941/42 season saw Pompey play in the newly formed London War League and was notable for the 16 goals the Blues put past Clapton Orient in a one-sided home victory. Guest player Andy Black from Hearts helped himself to eight goals on the day, while Harry Walker in the Pompey goal must have thought long and hard about how a clean sheet evaded him. Pompey’s defence of their league title started slowly with three defeats in the first six games but Championship form was swiftly resumed with this crushing home defeat of the Toffees. Leading the line that day was the ruggedly magnificent Duggie Reid who weighed in with a hat-trick, Jolly Jack Froggatt nipped in for a brace. Nippy Nicky Jennings began the rout of the West Londoners in the 28th minute and finished what he started three minutes from time with a well-taken second. Richie Reynolds, Mike Trebilcock, Fred Smith and Eoin Hand scored one apiece to play their part in the demolition. A good Saturday was made complete by that lot down the road losing 3-0 to Chelsea. 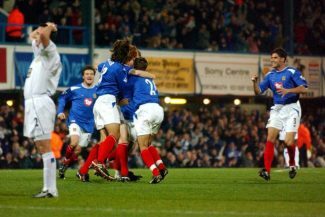 Millwall were given a good old shellacking by Jim Smith’s Pompey with Guy Whittingham notching a hat-trick in front of a home crowd of just under 15,000. Martin Kuhl, Alan McLoughlin and ‘Brickie’ Burns were also on the scoresheet that day. For those who revel in this sort of detail, Millwall’s consolation goal was scored by Dutchman Etienne Verveer. Harry Redknapp’s table-toppers stayed on course for automatic promotion to the Premiership with the 6-2 demolition of Derby (managed by Pompey old boy John Gregory). It was an early demonstration of recently-joined striker Yakubu’s power and prowess in front of goal. Svet Todorov, Matty Taylor and Magic Man Merson also registered. Pompey hit six in a thumping Premier League win against Peter Reid’s Leeds in a game that started half an hour late due to floodlight failure. When the lights finally came on it was Dejan Stefanovic who opened the scoring followed by a Gary O’Neil brace and strikes by Patrik Berger, Yakubu and flame-haired Aussie Hayden Foxe. Alan Smith grabbed one back for the visitors. The Premier League’s all-time highest scoring game saw Pompey concede four and still run out comfortable winners by three clear goals. There were nine different scorers in the game including Benjani, who claimed three, Hreidarsson, Kranjcar, Davis and Muntari. Reading even managed to miss a penalty, and stranger still Dave Kitson actually netted. In fact, the game was so open even Papa Bouba Diop nearly scored. Pompey playing at home in front of the Sky cameras nearly always guarantees an away win but this 6-1 thrashing of Leicester was the very pleasant exception that breaks the rule. Pompey had actually lost to Leicester a few days before in the Carling Cup that made the result even more satisfying. Lawrence and Kitson (yes, him again) both scored braces with Brown and Nugent making it an even dozen. The 6-1 crushing of Cheltenham saw the Blues crowned as League Two champions in the most improbable style as Pompey jumped from third to the top of the table on the last day of the season. Kal Naismith led the proceeding with a couple followed by Kyle Bennett, Jamal Lowe, Gareth Evans and a sloppy own goal. Absolute scenes prevailed.